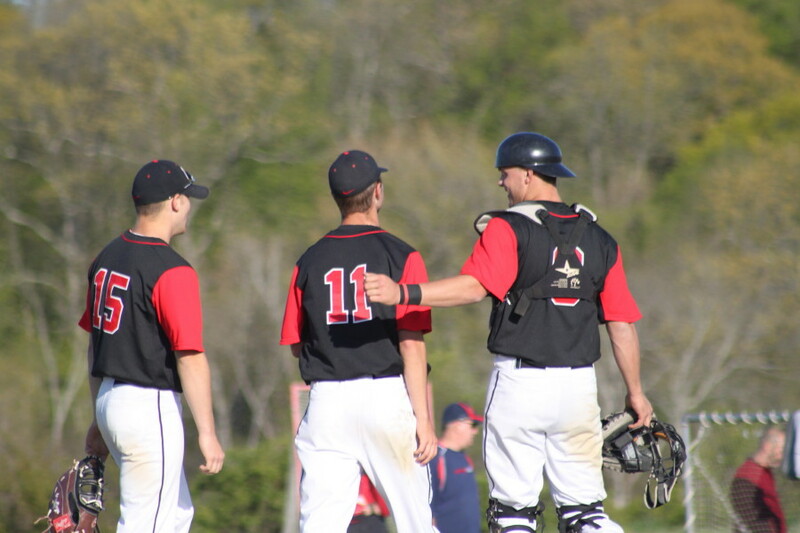 Tyler Leavitt gets congratulated by catcher Brandon Walsh after striking out his 12th Viking to end the game. 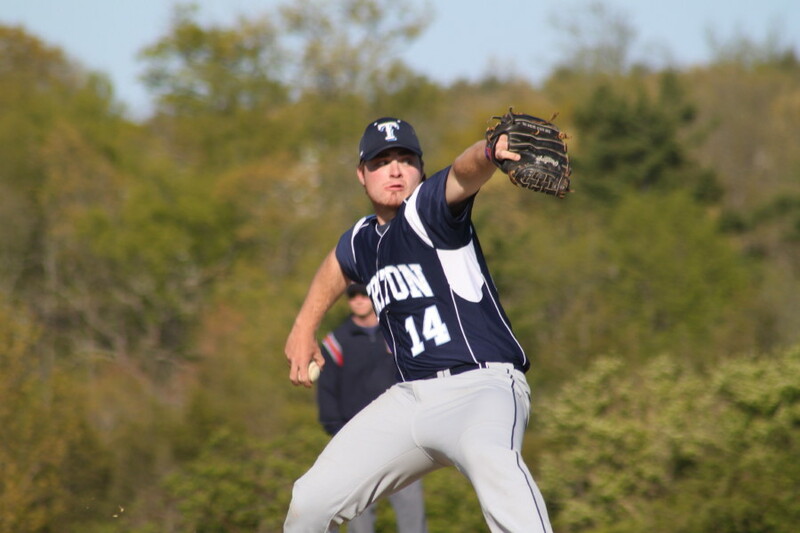 (Byfield) It looked after four innings as if Triton might be able to do something no one else had been able to do in three seasons……defeat North Andover pitcher Tyler Leavitt. 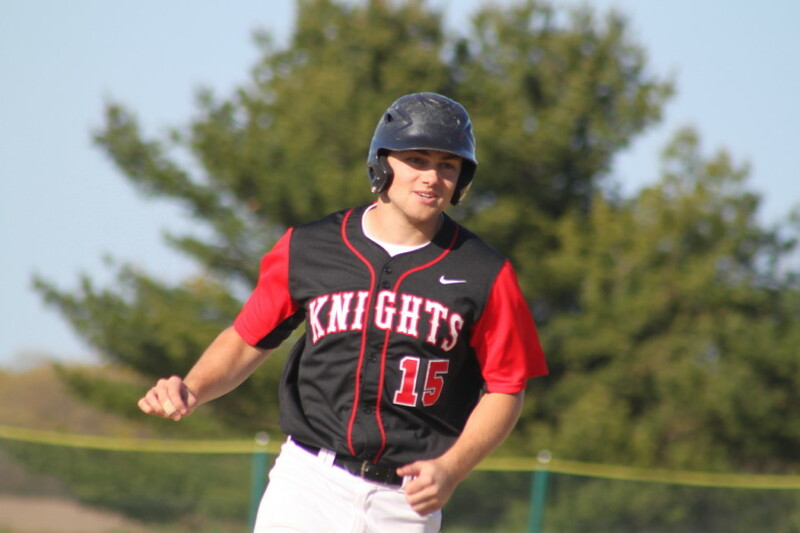 However, the upset notion went down the drain in the fifth inning as the Knights (8-3) put up five runs and went on to defeat the Vikings, 7-1, on a surprisingly pleasant Sunday afternoon at Triton in Cape Ann League action. Triton (3-7) scored a run in the first and threatened in the second but were limited to three base runners over the final five frames. Tyler Leavitt escaped the jam (runners on second and third with one out) in the second with a strikeout and an infield grounder. Tyler (12 K’s) had strikeouts in every inning including the last five batters he faced. 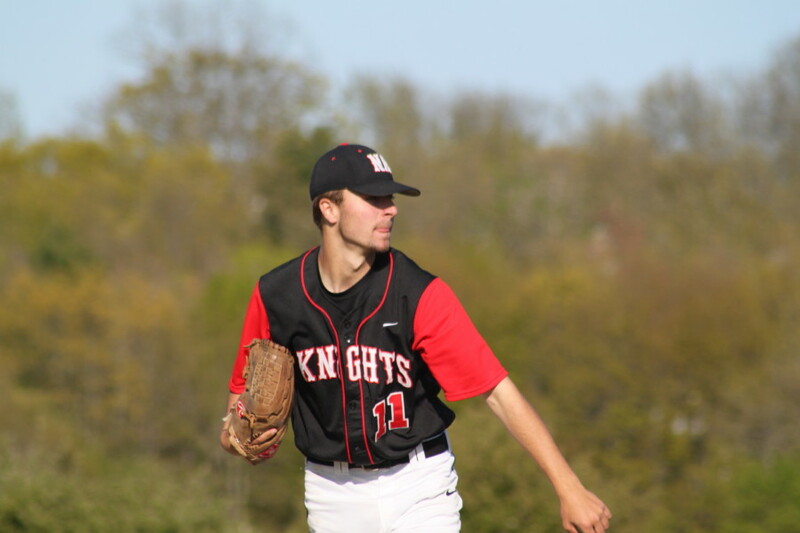 The senior lefty will be pitching for Southern Maine next season. I learned at the game that Tyler was 6-0 as a freshman on the junior varsity, 4-0 as a sophomore, 6-0 as a junior, and now 3-0 as a senior. 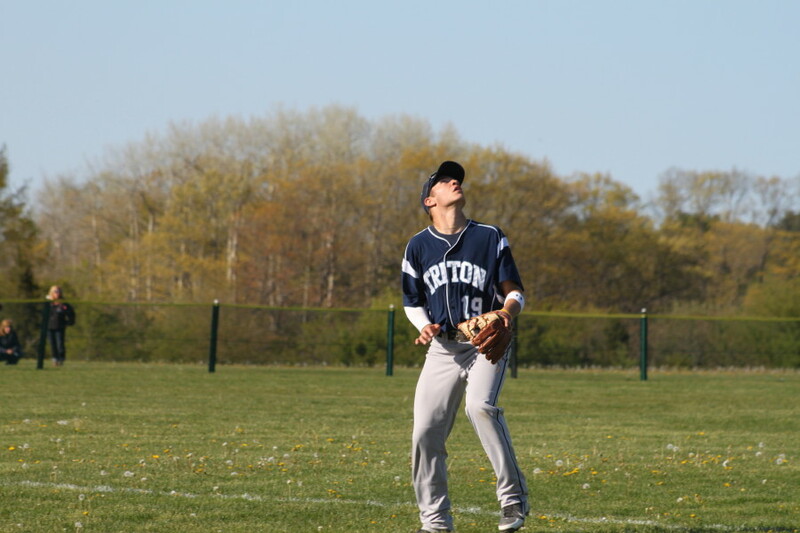 Triton starter Nick Cornoni got out of a base-loaded situation in the second and held a tenuous 1-0 lead into the fifth. In the fifth, Dan Rivet singled in NA’s first run and an infield error (Rich Fecteau) allowed Mike Borzi to cross with the second one. Brandon Walsh delivered two more (Dan Rivet and Rick O’Connor) with a double down the leftfield line. Brandon crossed with the Knight’s fifth run of the inning on Dan Laorenza’s single to right. Those five were more than enough the way Tyler Leavitt was pitching. 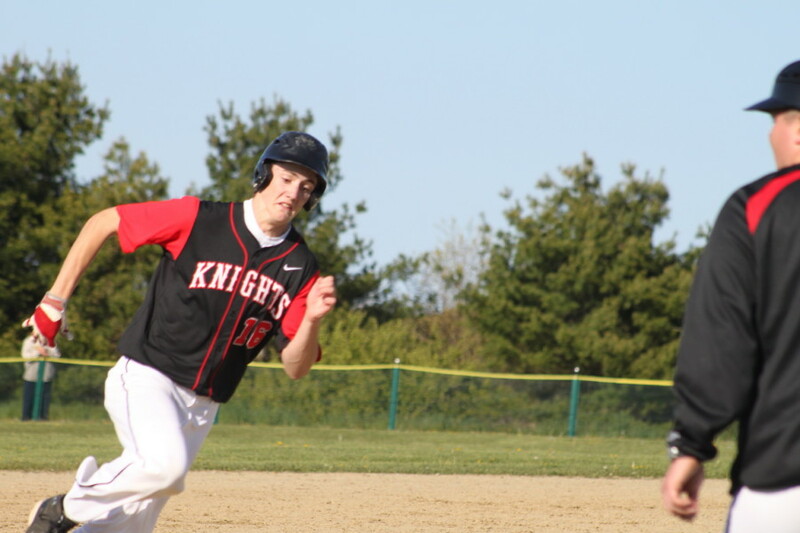 The Knights collected solo runs in the sixth and seventh. Tyler Whitley homered over the leftfield fence off reliever Jack Germinara in the 6th. Brandon Walsh doubled in the 7th, stole third, and came home on Tyler Leavitt’s sacrifice fly. 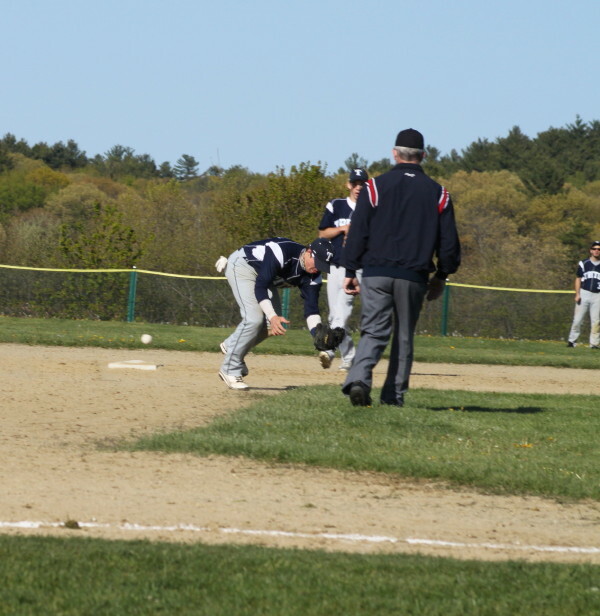 The Triton run was scored by Rich Fecteau on a sacrifice fly by Mike Fish in the first inning. Tyler Whitley in home run trot after clearing the left field fence in the sixth. Brandon Walsh and Dan Rivet each had two hits in NA’s 10-hit attack. 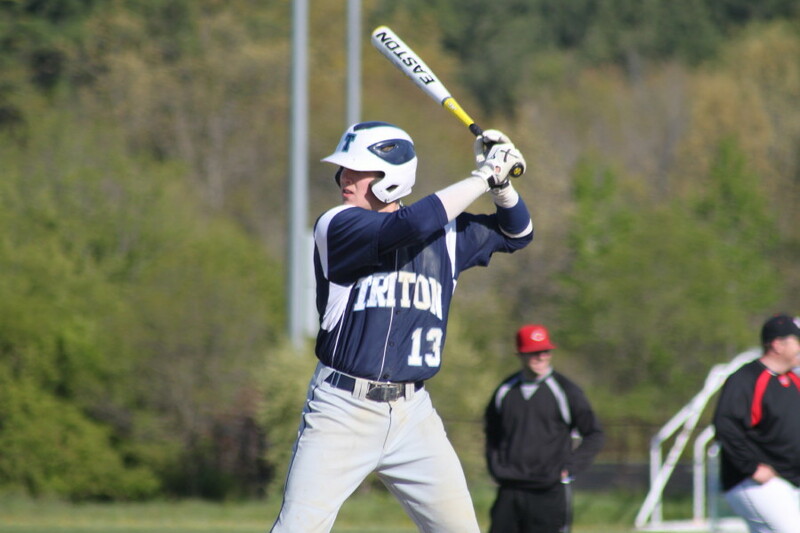 Dmitri Hunt had two of Triton’s five hits. 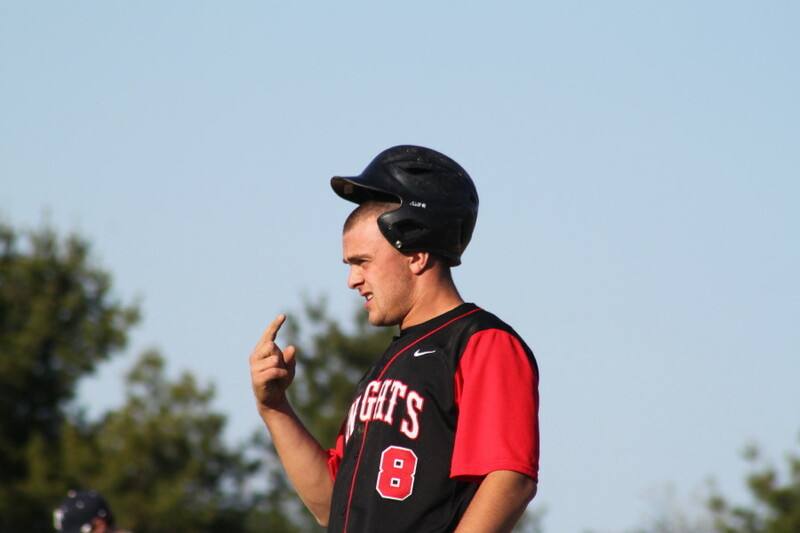 The Knights Dan Laorenza appeared to injure his hand sliding into second in the fifth inning on an attempted steal. I was prepared for “typical” Triton weather and was pleasantly surprised. 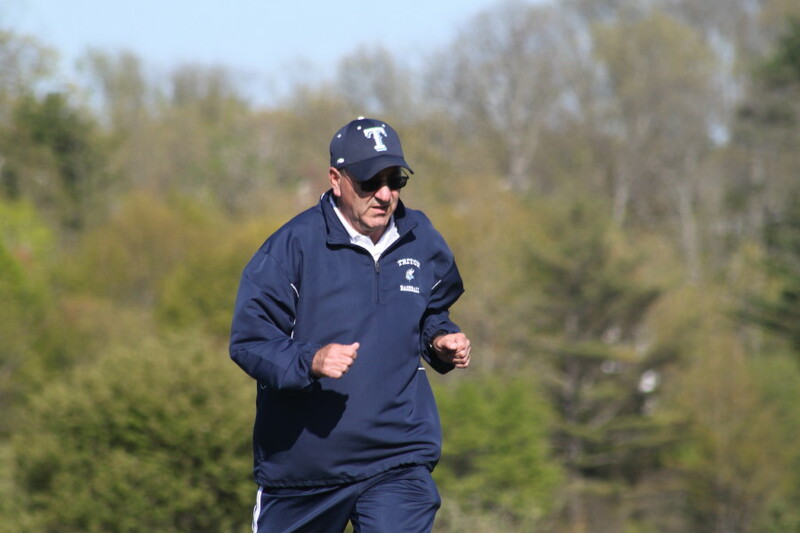 Triton is halfway through the 4-games-in-4-days part of their schedule. They face Masco at home on Monday. 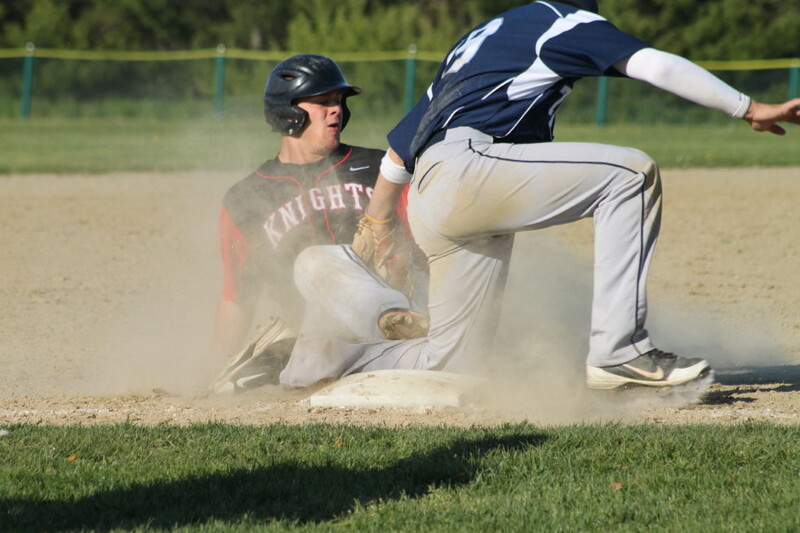 North Andover travels to Ipswich on Tuesday afternoon. Brandon Walsh ruled safe at third despite visual evidence that might suggest otherwise.